1Cream the butter in a standing mixer. Aerate room temperature butter for about 1 minute on medium speed. 2Add the sugar, about 1 cup at a time, until it is fully incorporated. Then add the next cup and incorporate again. Repeat until you have added all the sugar. (Be sure to scrape down in between mixing). Last, add the vanilla and salt. Beat at low speed for 15 seconds until incorporated. Finally, whip (on medium to high speed) for about 4-5 minutes until light and fluffy. Add a morsel of pink color, and enjoy! 1Sprinkle a bit of cornstarch and roll out a small handful of pink fondant. Cut your XO shapes and set aside. 2Fill a piping bag using an Ateco 805 tip or cut the tip of the bag to be one centimeter in diameter. Pipe in a circular direction starting at the edge leaving yourself a 1/4" border - swirl up! 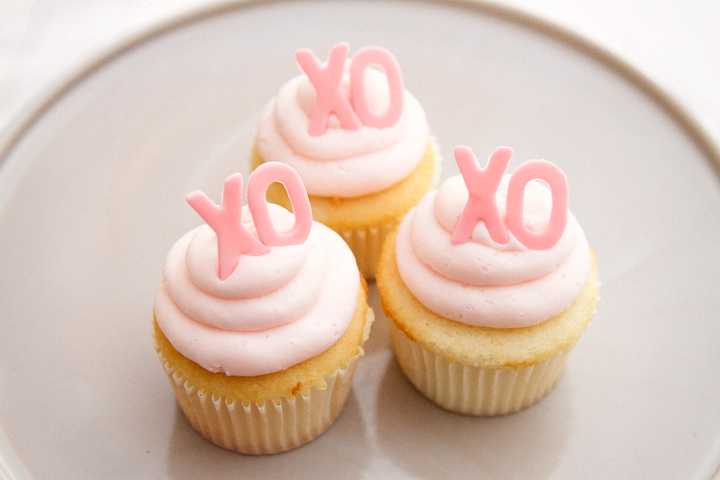 3Last, place the XO atop the cupcake.